In the U.S., 61% of all households currently have WiFi networks installed at home. According to data from Strategy Analytics, this means the U.S. is ahead of countries like Spain (57.1%), Mexico (31.5%) and India (2.5%). 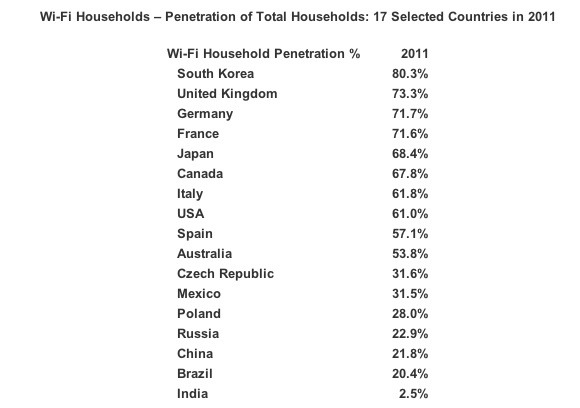 At the same time, though, this only puts the U.S. somewhere in the lower half of WiFi adoption among developed nations. In countries like South Korea (80.3%), the UK (73.3%) and Canada (67.8%), significantly more households currently have WiFi networks installed. China, where WiFi penetration is currently only at 25%, will likely become the largest driver of global WiFi growth. Strategy Analytics expects that more than 110 million additional Chinese households will get WiFi within the next five years. Indeed, according to this study, China alone will account for 31% of global WiFi household growth within the next five years. By 2016, Strategy Analytics predicts, about 800 million households worldwide will have WiFi access at home. That’s a global penetration of about 42%. One related trend this study doesn’t talk about, by the way, is a global move towards the usage of small cells and femtocells at home. According to some recent estimates by Informa Telecoms & Media, the installed base of these devices, which are basically small, low-powered cell phone towers for your house, could grow from 2.5 million this year to 59 million by 2016. Many of these devices will combine both 3G and LTE wireless capabilities with WiFi technology.